Be the first to share your favorite memory, photo or story of Harriet. This memorial page is dedicated for family, friends and future generations to celebrate the life of their loved one. Harriet Carter, 77 made her transition to be with the Lord on Friday, January 26, 2018. Harriet was born to the late Herman and Dorothy Coleman on August 28, 1940. She was a devoted wife, mother, grandmother, sister, aunt and friend. Harriet was preceded in death by her husband Randolph Cater Sr., her son Dennis Terry Carter, her sister Virginia Hall, her brother-in-law Samuel “Bubba” Hall, and her devoted pet and close friend Kuskha Carter. After graduating from George Washington Carver Regional High School in 1959, Harriet was a devoted wife and mother. Once her youngest child entered school, Harriet joined the workforce as a Health Care processional with the Orange County Nursing Home. She retired from the Nursing Home in 2008 with over 35 years of service. 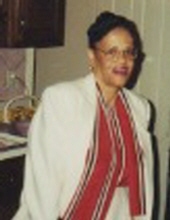 Harriet leaves to cherish her memories, son Randolph Carter Jr., daughter Pamela Carter-Purce, one son-in-law Clayton Purce, granddaughters Faith Alexander, Carmelita Carter, Daphne Hill, Kopper Carter, two great grandchildren, two brothers Herman Coleman Jr., Leroy Coleman, and; several brother and sister in-laws, nieces, nephews, cousins and friends. To send flowers or a remembrance gift to the family of Harriet Doris Carter, please visit our Tribute Store. "Email Address" would like to share the life celebration of Harriet Doris Carter. Click on the "link" to go to share a favorite memory or leave a condolence message for the family.